Nearly time to change the title to spring!!! Tues looks like a blustery day with wintry showers and snow possible on mountains on higher elevations more so in Northern counties. Chance of hail and some lightning also. 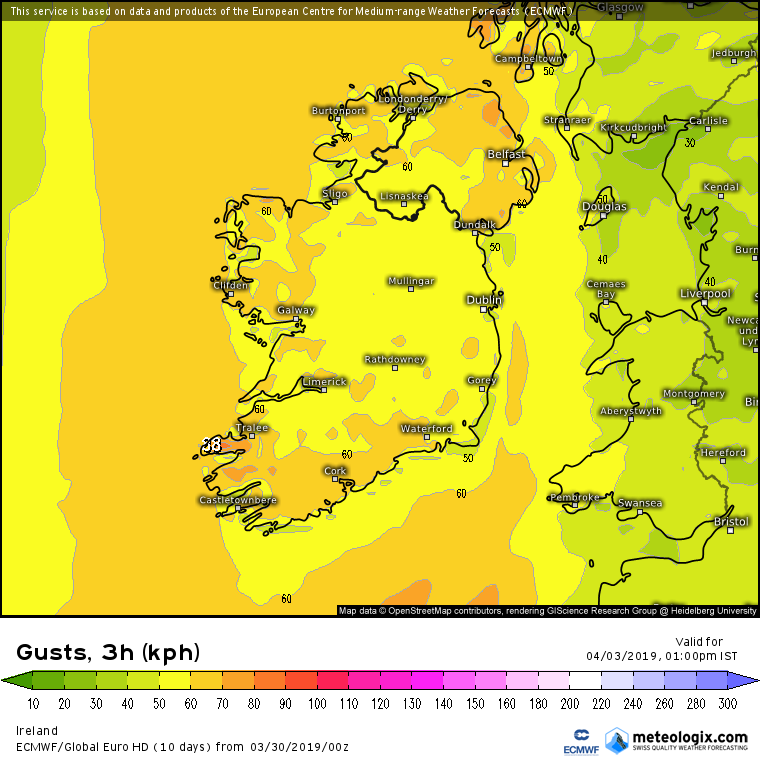 Cold day with a considerable wind chill in those strong NW'ly winds. The charts certainly looking cold next week with very cold nights which will come as a bit of a shock to the system after the fine spell of weather. 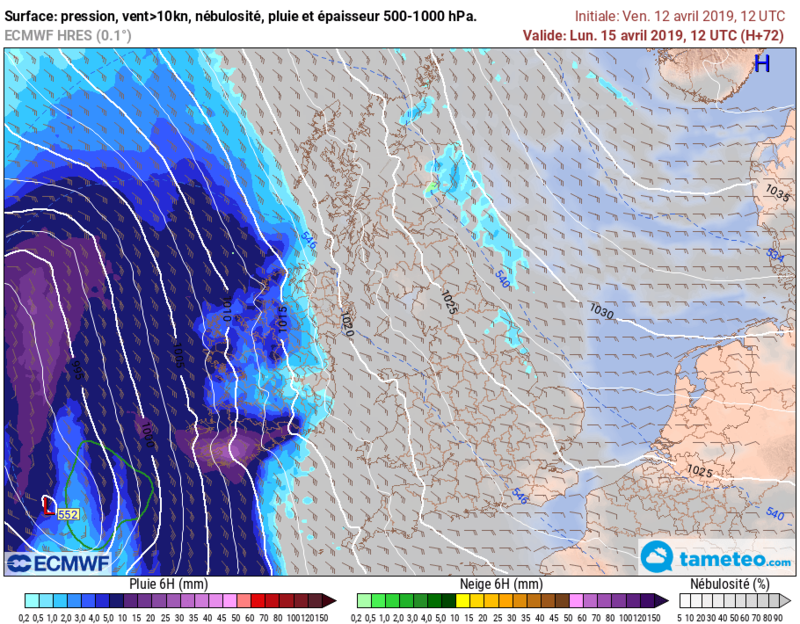 More than likely seeing snow capped mountain tops and Tues still looking like wintry showers with the NW, W and SW now showing up as likely areas getting numerous heavy showers with hail mixed in. Tues is shaping up to be a very convective type day , and with the sun getting stronger lightning becoming more of a possibility with the passage of an upper Low. 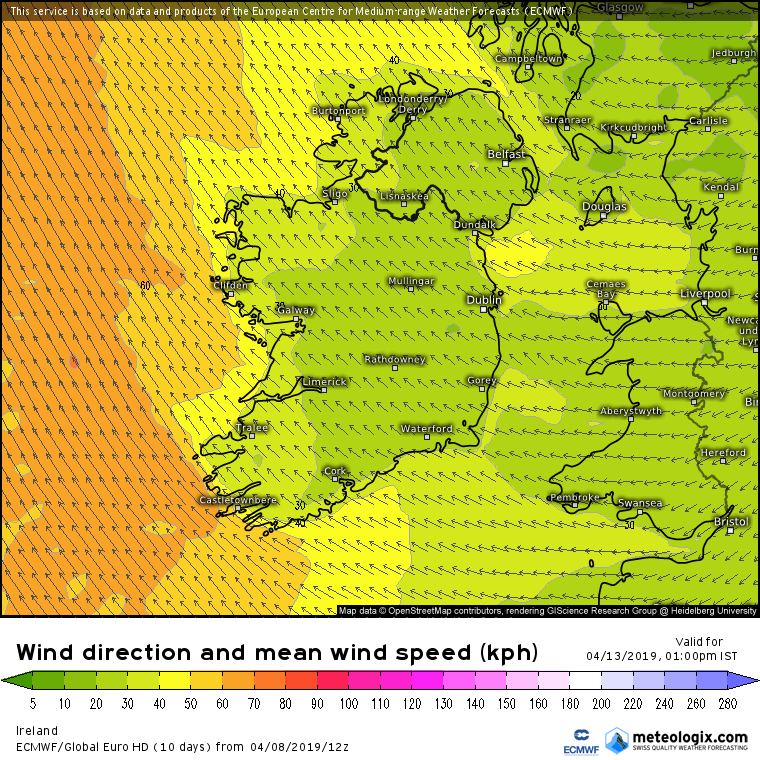 Stronger winds now staying more on Atlantic coasts on Tues, Weds breezy overland. 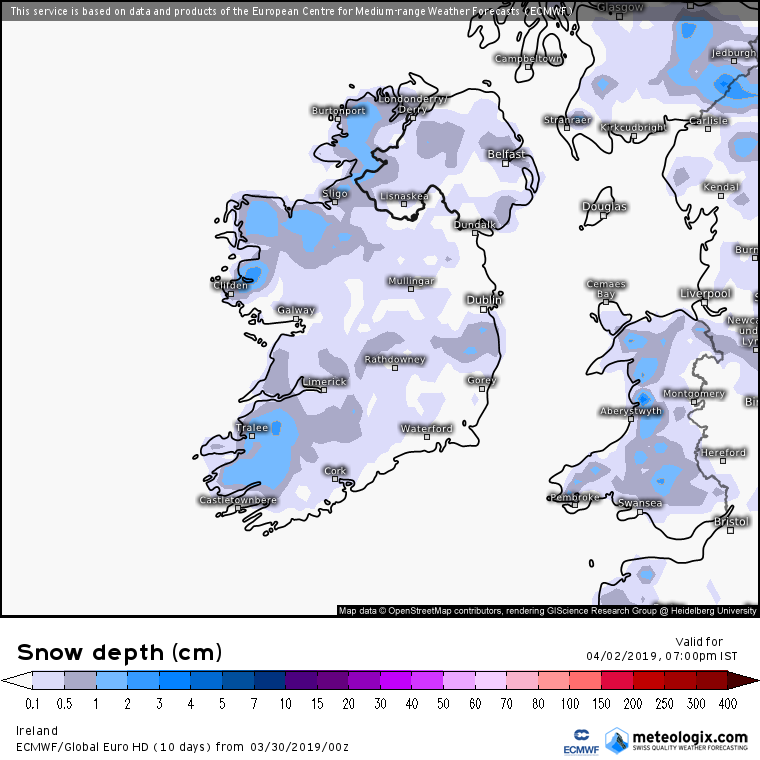 Wintry showers on high ground potential on Tues with snow possible high up on mountains. Feeling very cold in the wind. 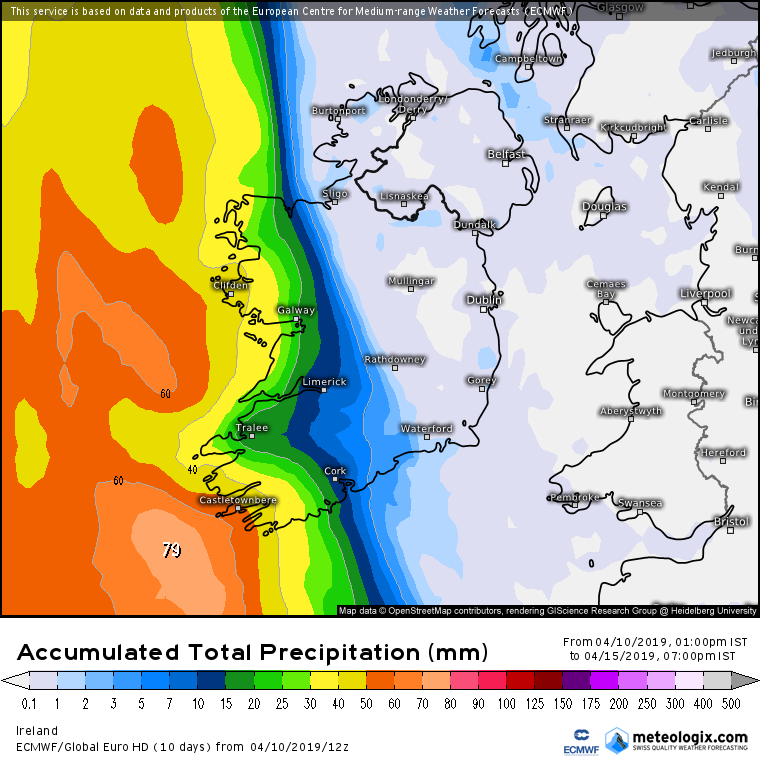 The 528 dam line well below Ireland on Tuesday, Showers becoming increasingly wintry with hail as we move into Tues. 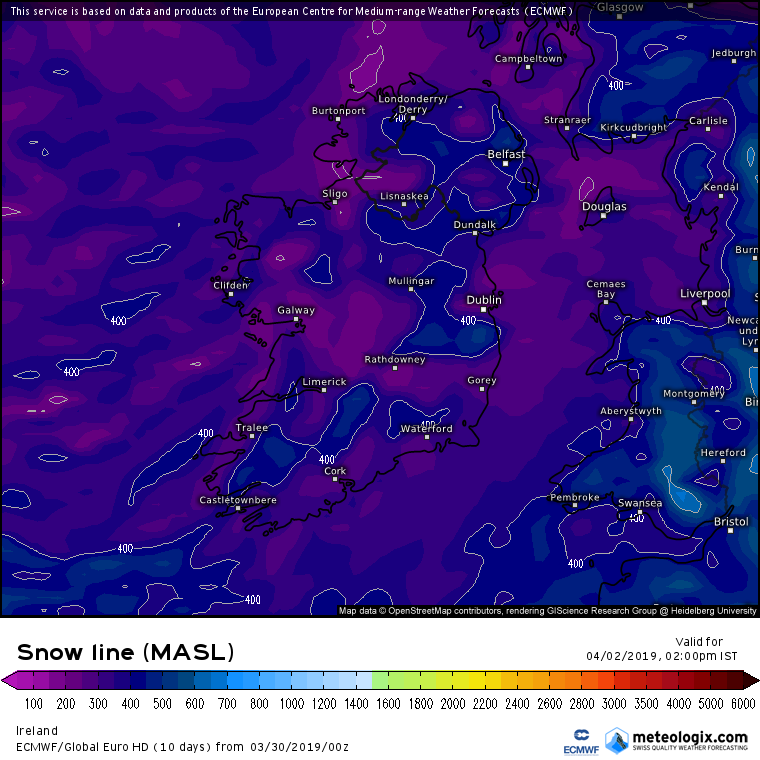 The area of LP running down the country on Tues now showing a tighter gradient since earlier runs. One to watch to see if it gets any stronger which it could well do. 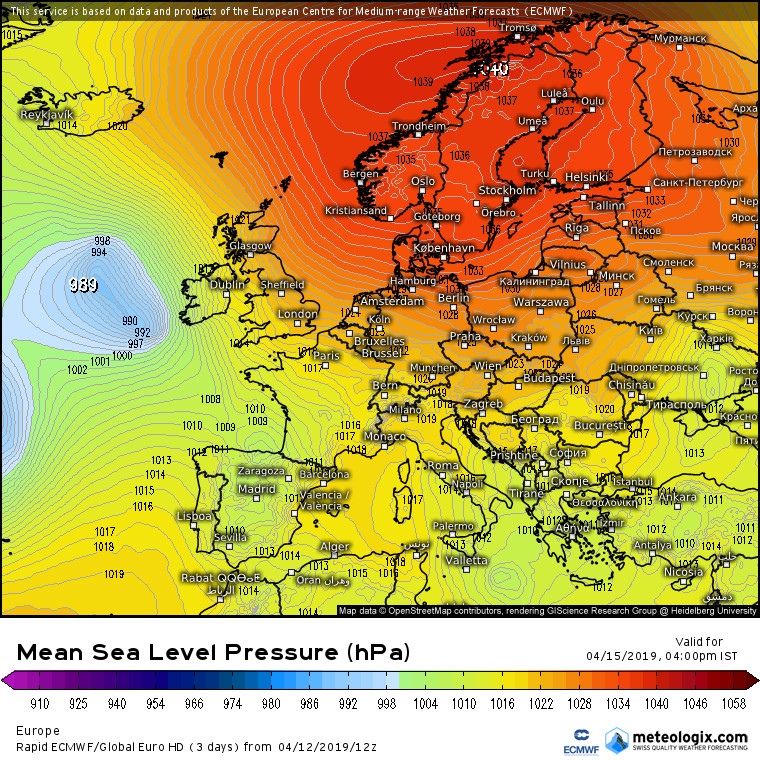 Will see what the ECM 12Z brings out shortly. 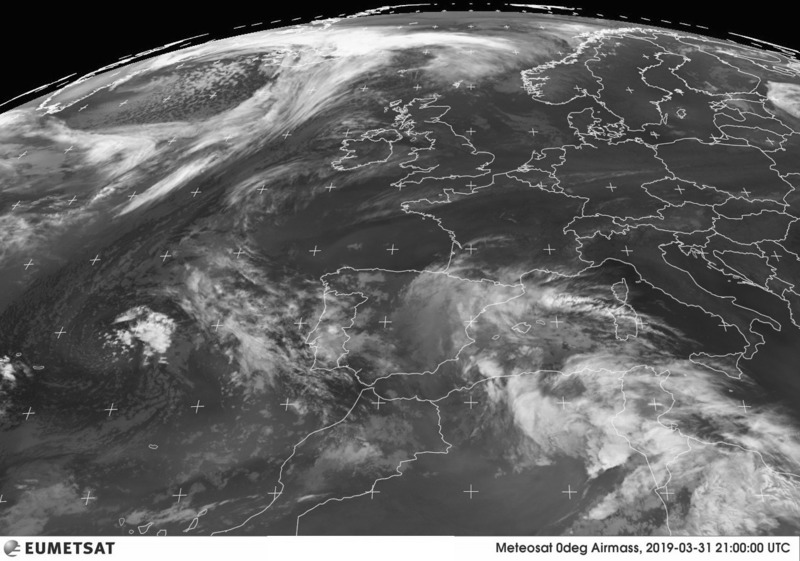 The cold front off the W coast of Ireland which will make its way on to the coasts tomorrow evening followed by the cold blast of polar air carrying numerous showers behind it . 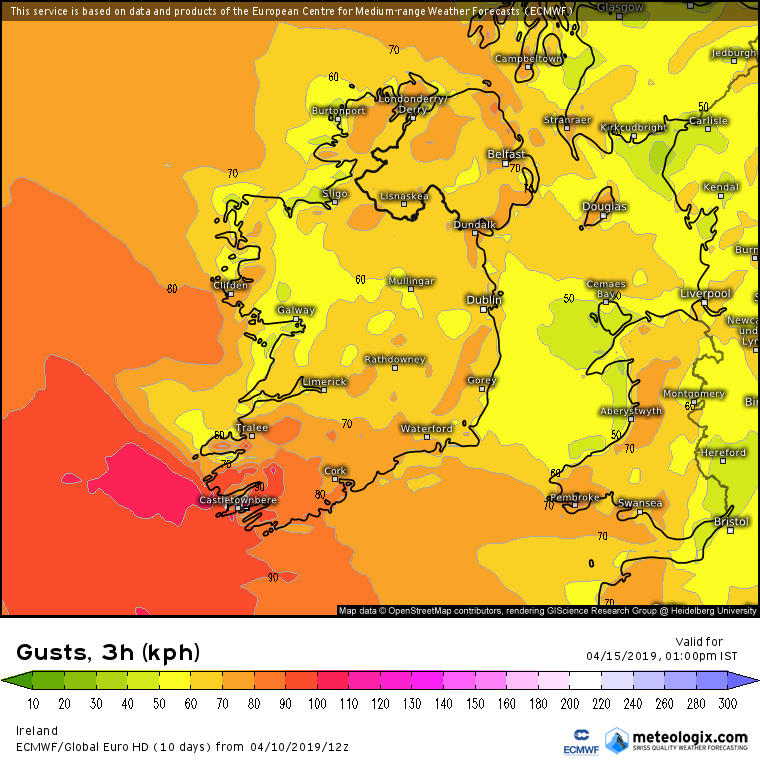 Tight gradient along Atlantic coastal counties on Sat by the looks of it giving windy conditions. 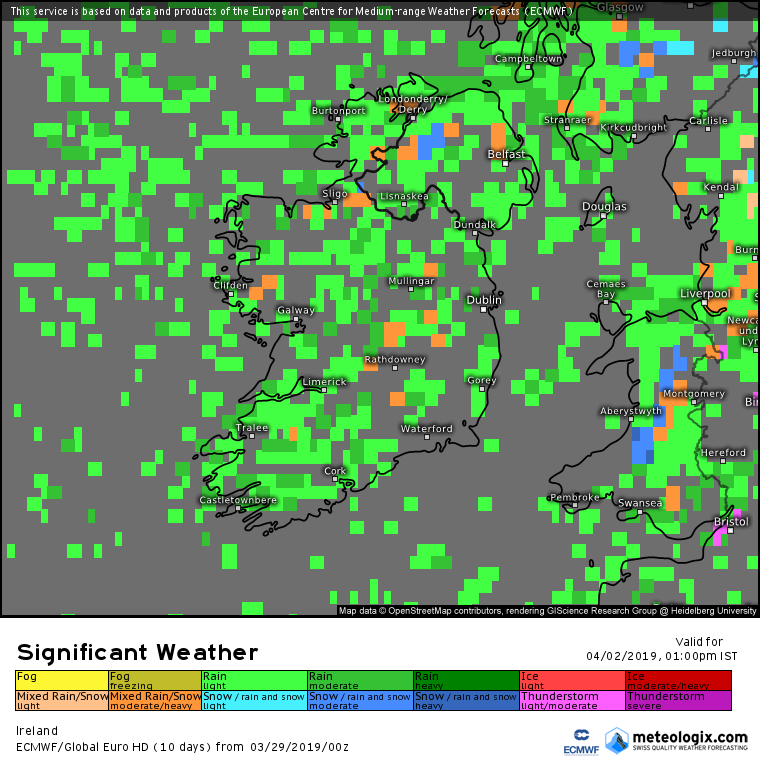 ECM 12C showing the weather moving inland by Sunday and atm looks like there could be some very heavy rain overnight Sat into Sunday and very wet in Southern counties on Sunday. 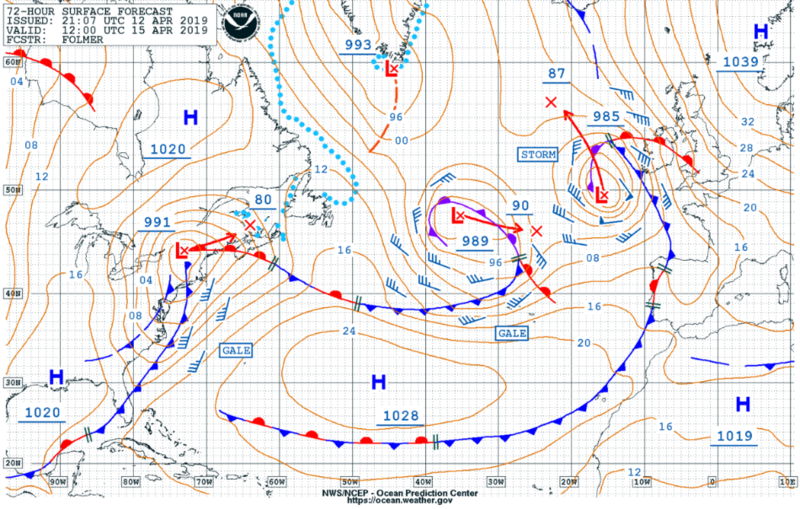 Still uncertainty at this stage though. 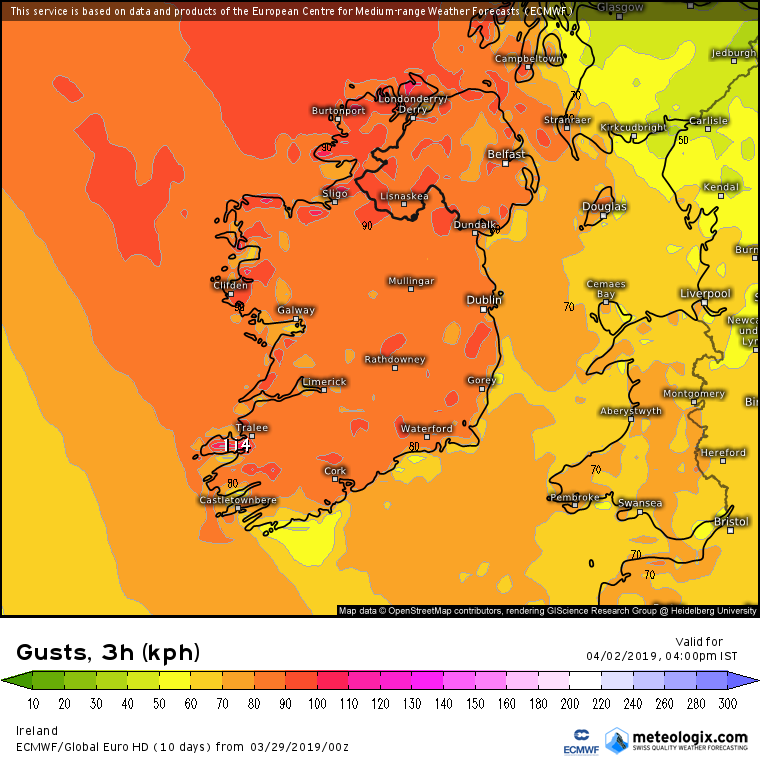 Looks to get increasingly windy on Sunday also. 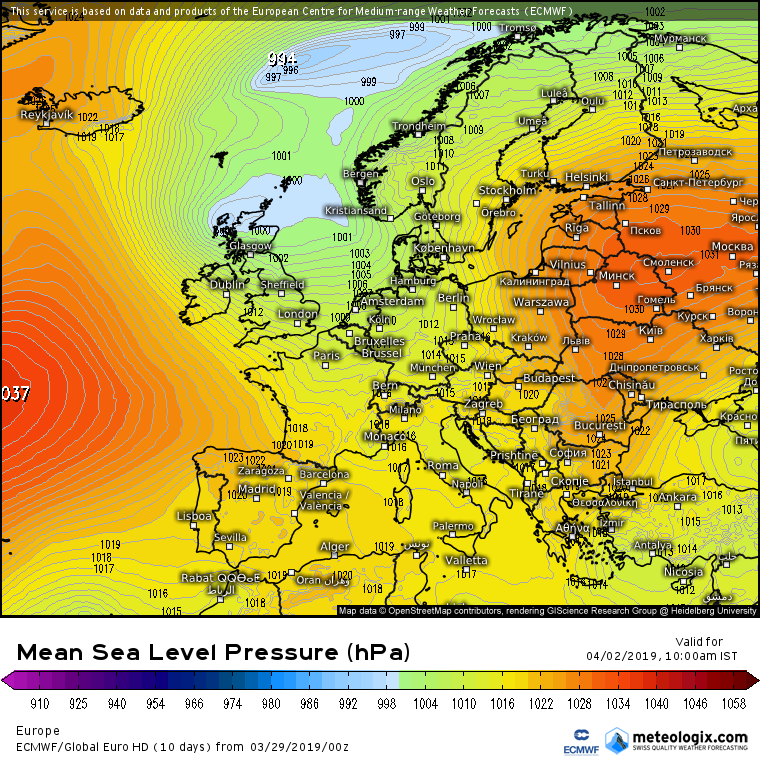 Last edited by Meteorite58; 09-04-2019 at 20:20. 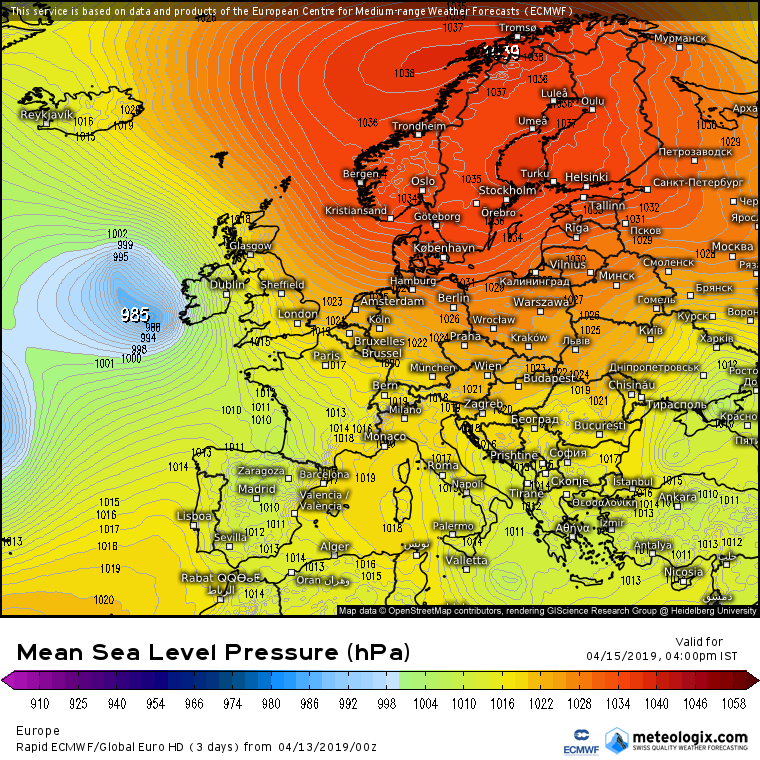 ECM has kept the heaviest rain to the coastal fringes from Sunday. ARPEGE not showing much until next Monday , GFS wet but nothing hectic , ICON showing by far the heaviest which looks like an outlier . This could nudge one way or the other yet, rain moving a bit more inland could give some high totals along coastal counties I would imagine. 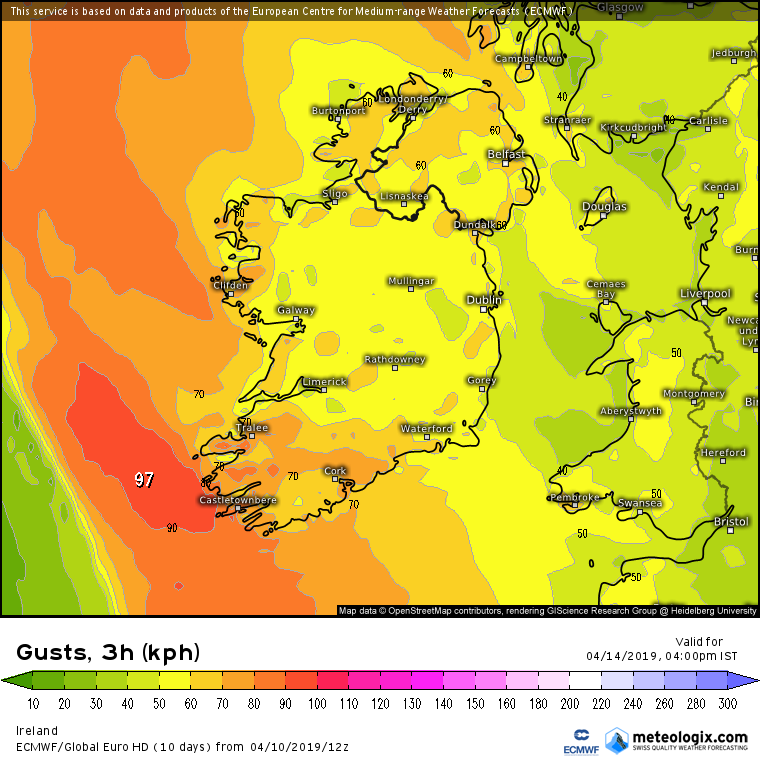 All showing it quite windy on Saturday , and still breezy /windy on Sunday but not as windy as Sat . 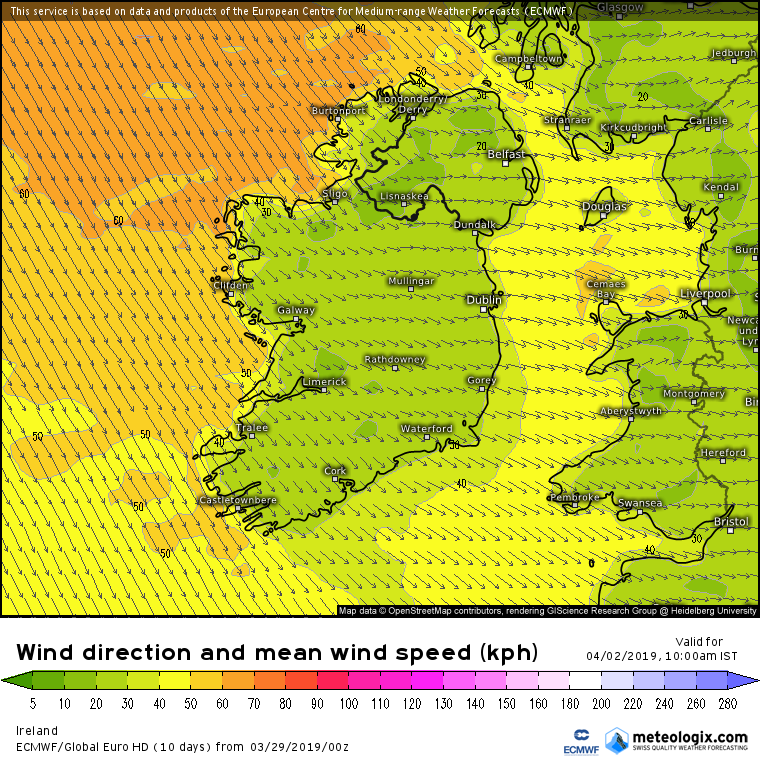 Windy also Monday for a time , more so in the SW /S at this stage . Models fairly similar except ICON showing it windier on Monday but this will probably come more in line with the ECM. 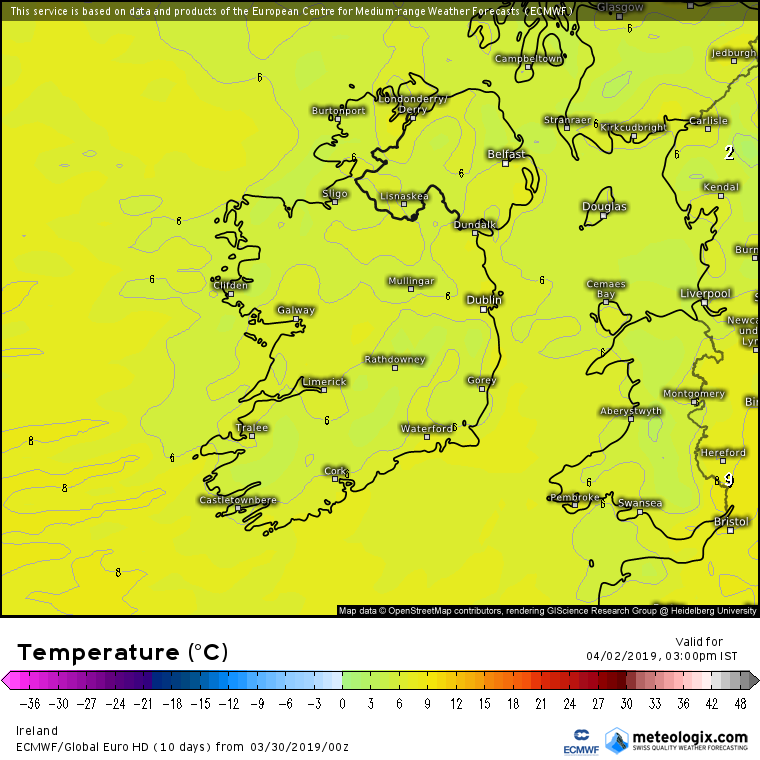 Will be a bit of a change after all the fine settled weather for many and looks like becoming more cold over the weekend . 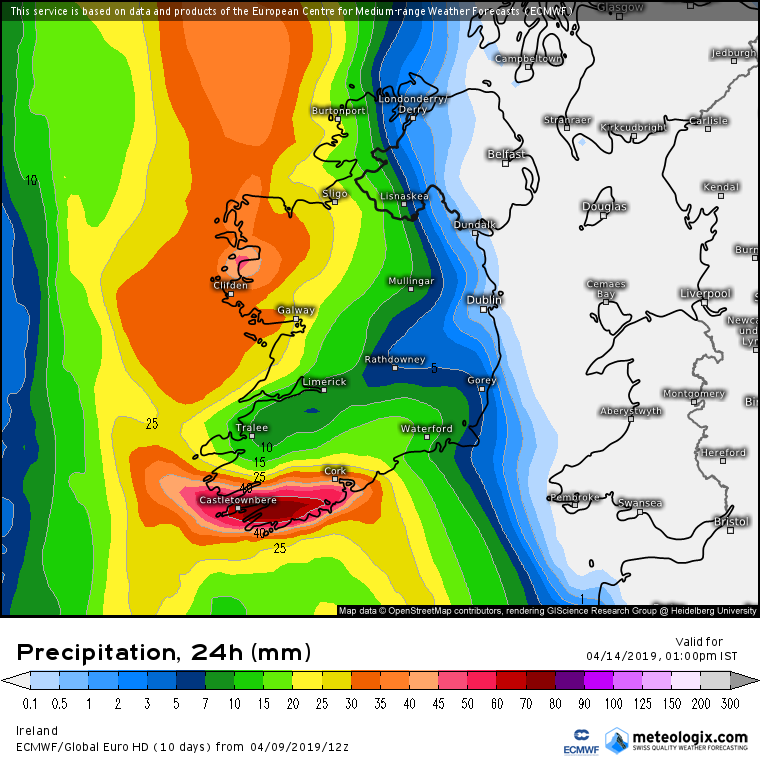 Monday looking exceptionally wet in the SW and S with fairly good agreement across the models . 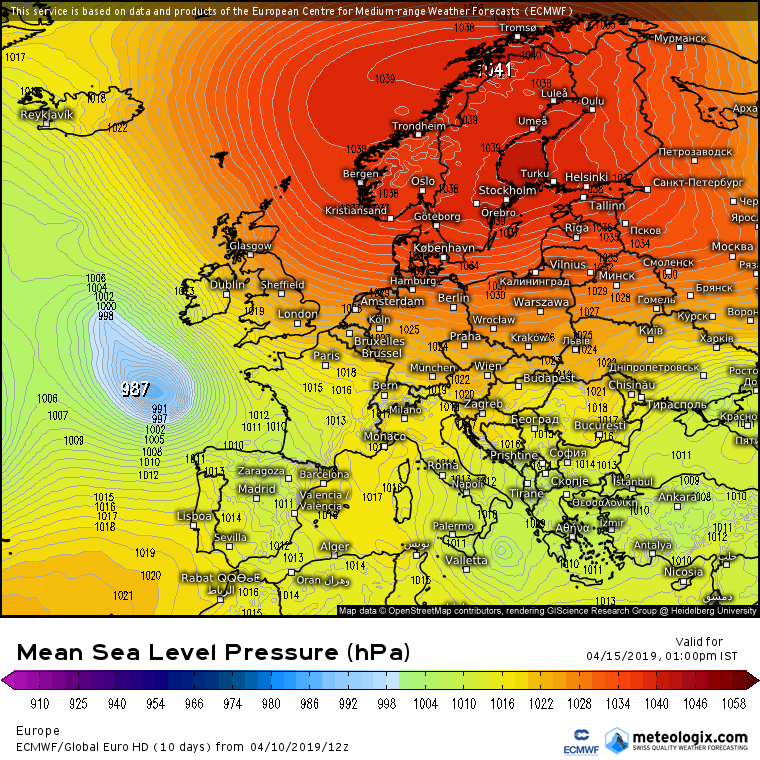 The ECM out in front with the highest 24 hr totals. I had doubts about ICON but it has held fast also showing some very high accumulations between Sat night and late Monday. 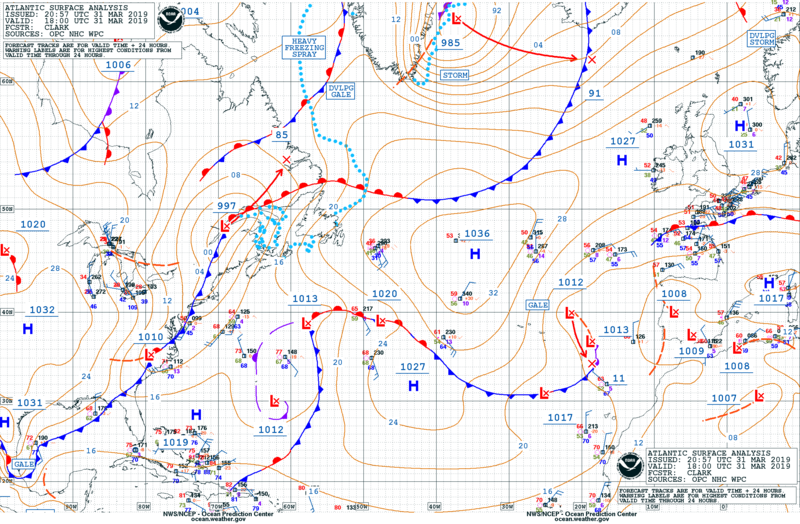 LP moves up off the SW and W coast and looks like a long trailing front drawn up over the country dropping a lot of its rain in the SW /S. Would think flooding might become an issue. 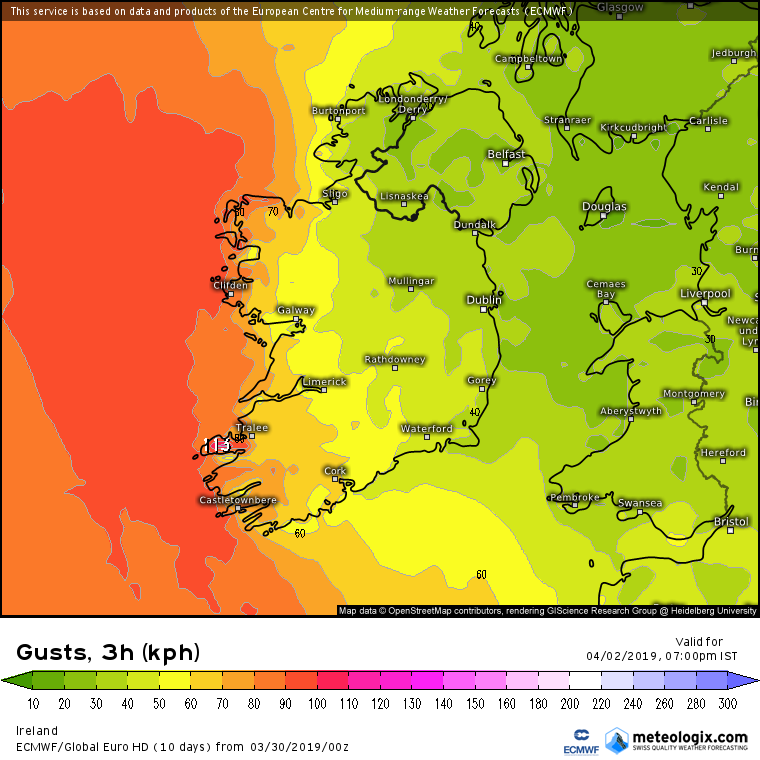 Windy Monday also, will need to watch this evolve. 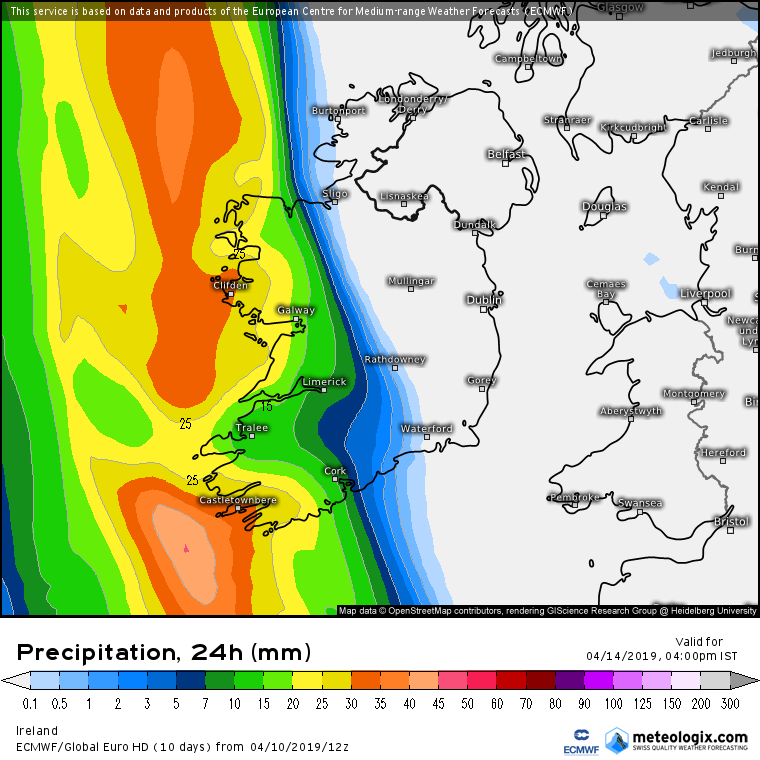 Models holding firm with what looks like exceptionally wet weather on Monday on top of Sat /Sundays rainfall. 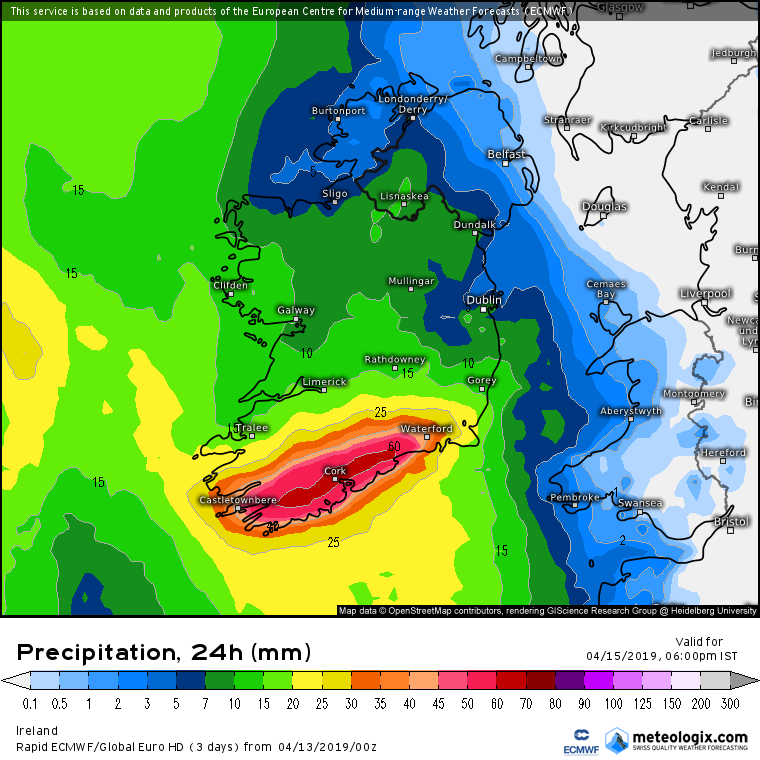 In Southern Counties looking like widespread 60 to 80mm and a large area of 80 to 90 mm closer to coastal areas of the S of Kerry, Cork and Waterford. 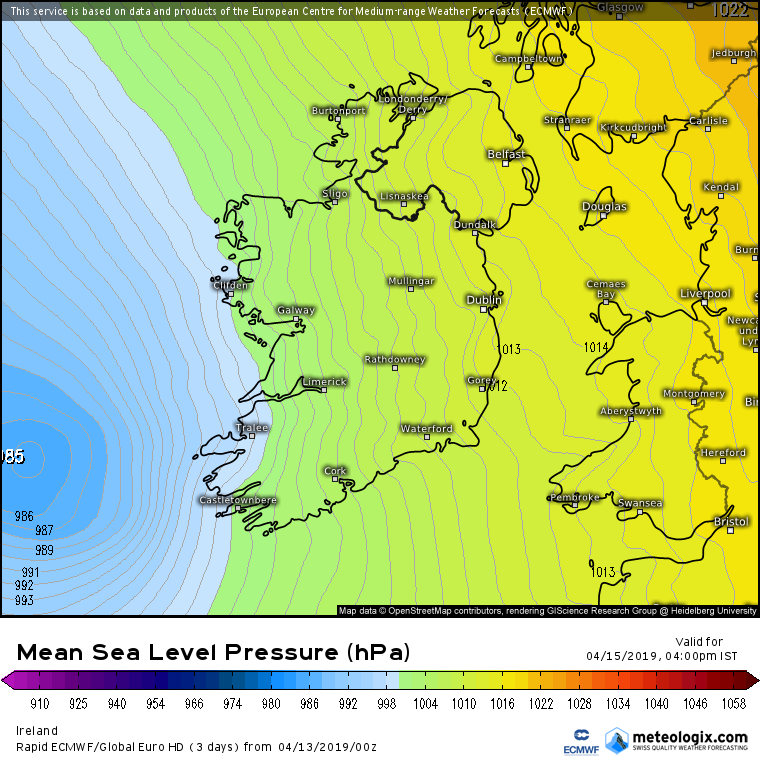 High Ground could see up to around 100mm up to 18.00 Monday. 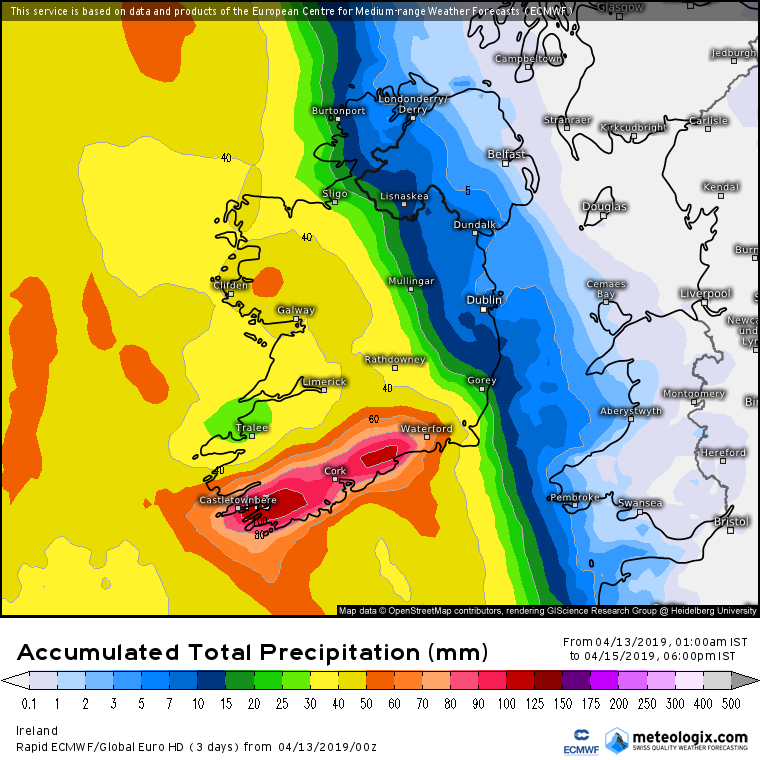 Large areas elsewhere could see totals up to 18.00 Monday of between 30 and 40 mm from a line between Wexford and Sligo. 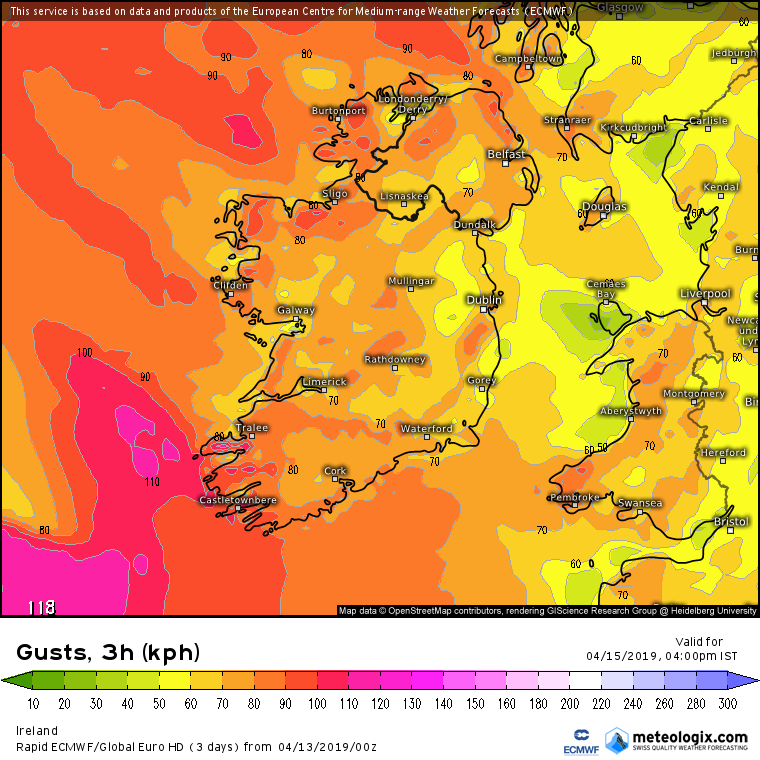 Looks like an Orange Rainfall warning coming up in Southern Counties for Monday. 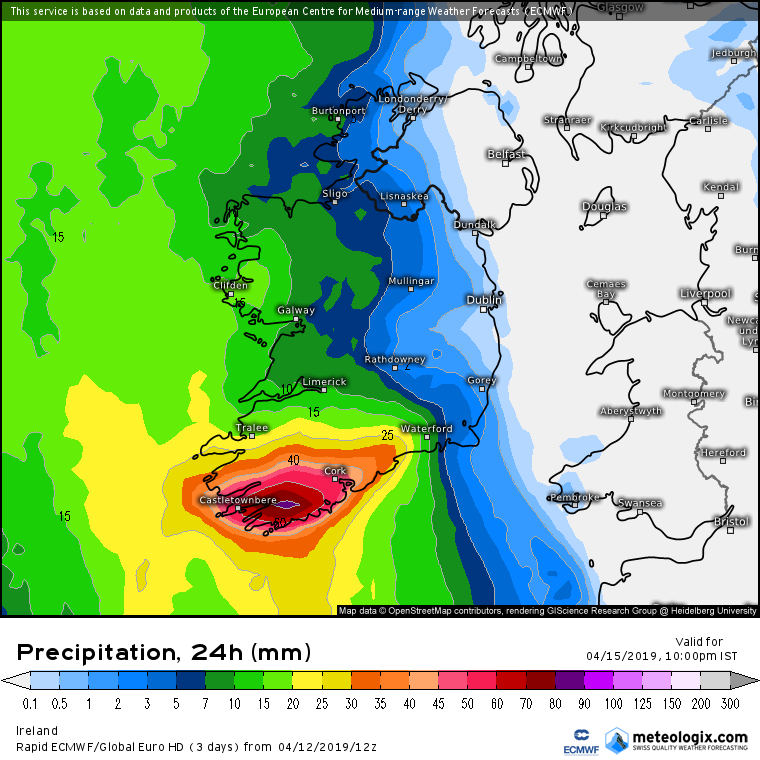 ECM 24 hr rainfall up untill 18.00 Mon. 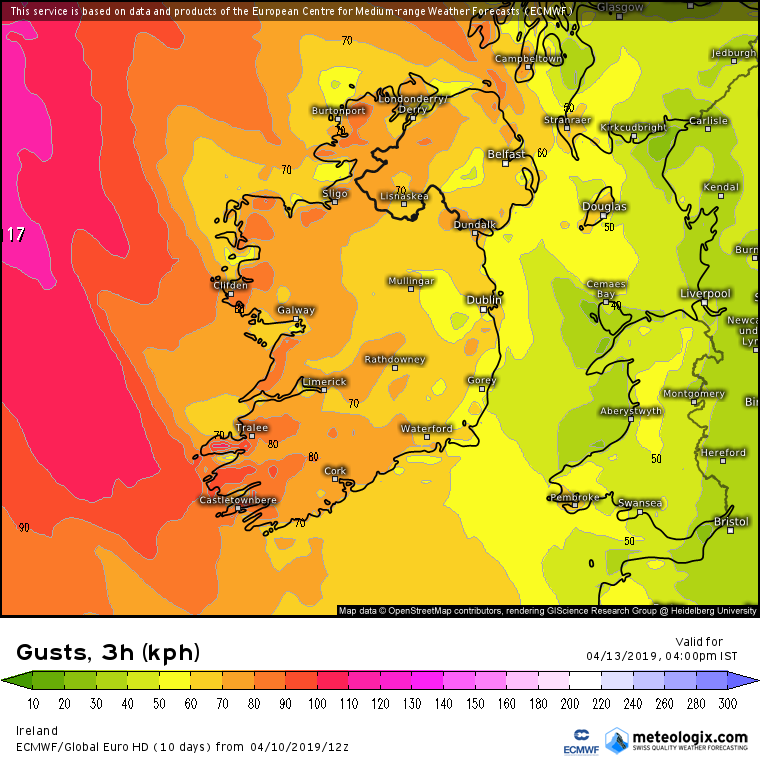 Models differing in timing and strength of winds from the LP tracking close to Ireland on Monday . Will need to watch the coming runs. 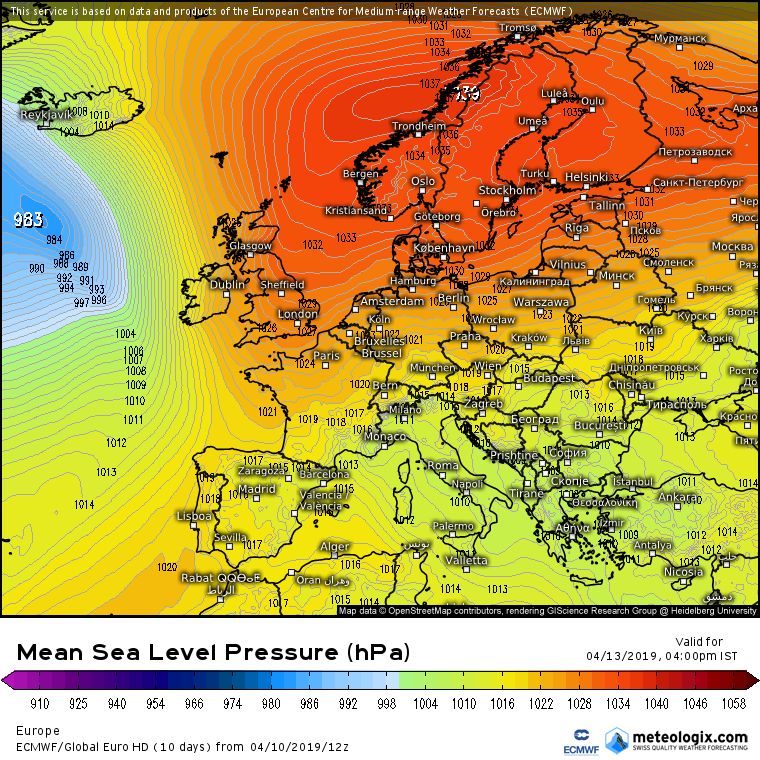 Rain staying out west in the Atlantic for Easter Sunday and Easter Monday now on latest models. it can stay there till next October! 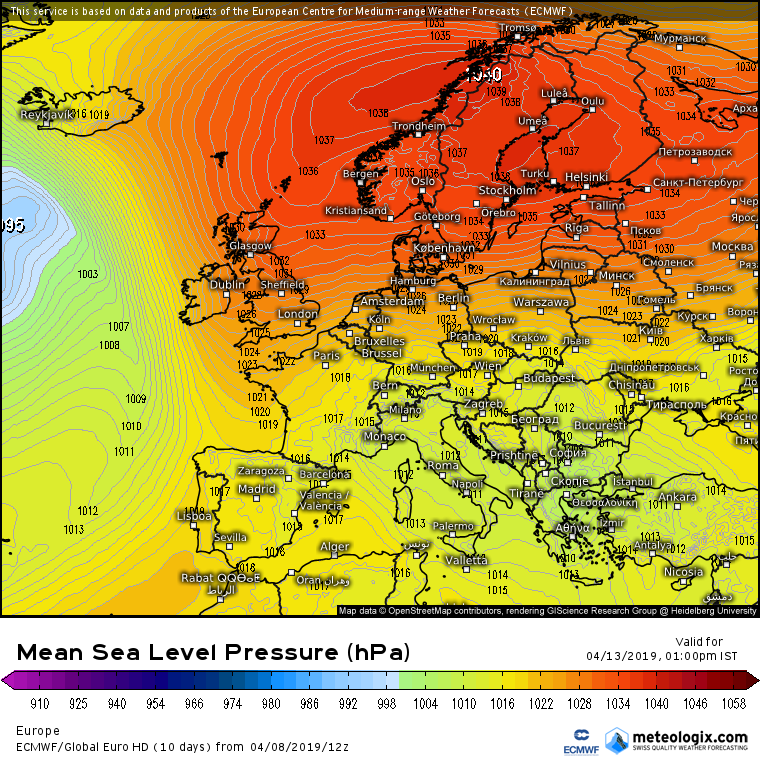 ah but seriously we can do with a break for some dry, warm and settled conditions, the past month has been too cold and unsettled for my liking. About time we get some warmth going.